fruit Archives - Pebbles, Inc.
National Watermelon Day with Amanda! Amanda here, & I thought we might celebrate this fun day with some super cute cards! Think melons, lemons, berries & cherries – it’s a fruit salad of My Bright Life inspiration! Oh-so-pretty! & SO many fruity possibilities within this collection! Love it! 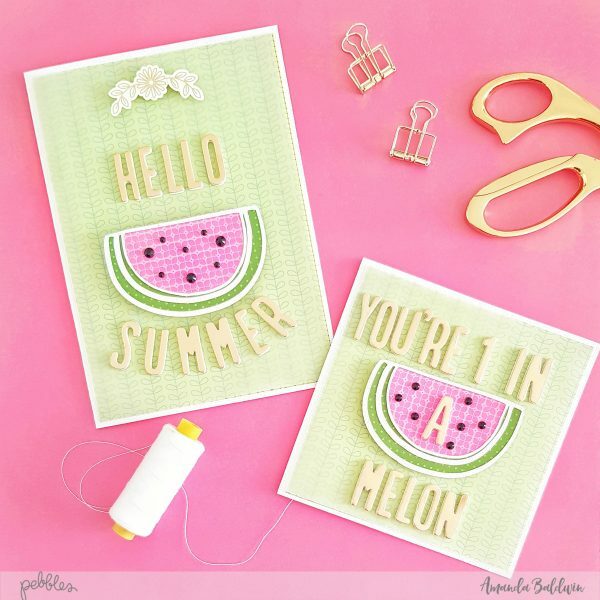 Here’s how I created those sweet watermelon cards…. 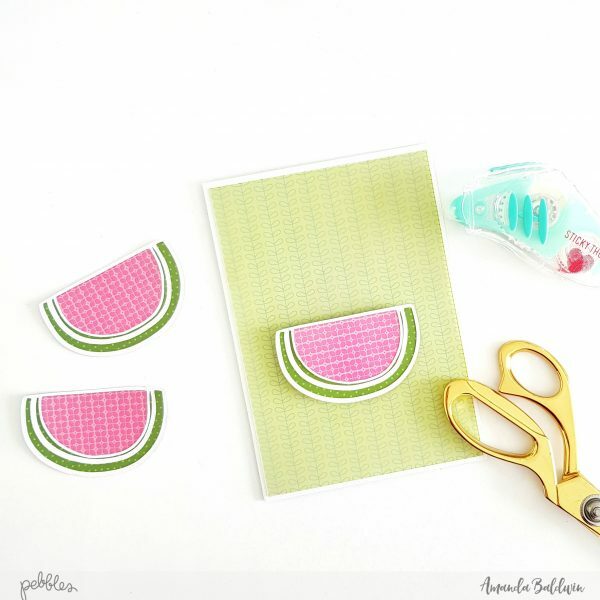 Use a metal die, digital cut file OR fussy cut your own watermelon die cuts from white cardstock. Paper piece the melons with patterns from the 6 x 6 Paper Pad. Take a 12″ x 12″ sheet of white cardstock and trim it 10″ x 7″ to create the 5″ x 7″ card, as well as 10″ x 5″ to create the smaller square card. Score down the centers, and fold to create the card bases. Trim the reverse side of pattern paper Retro Stripe to 4 3/4″ x 6 3/4″ & adhere to the front of the 5″ x 7″ card. To soften the vivid lime green paper (so it doesn’t distract your eye from the watermelons) cover it with a 4 3/4″ x 6 3/4″ sheet of clear vellum paper. Repeat this process for the smaller 5″ square card. Foam mount a watermelon to the center of the card fronts. Add Thickers for the card sentiments. Embellish with a gold foil Accent Sticker & for finishing touches use black sequins, gemstones or beads to make the melon seeds. Super simple, but oh so effective! You’re 1 in a Melon, indeed! 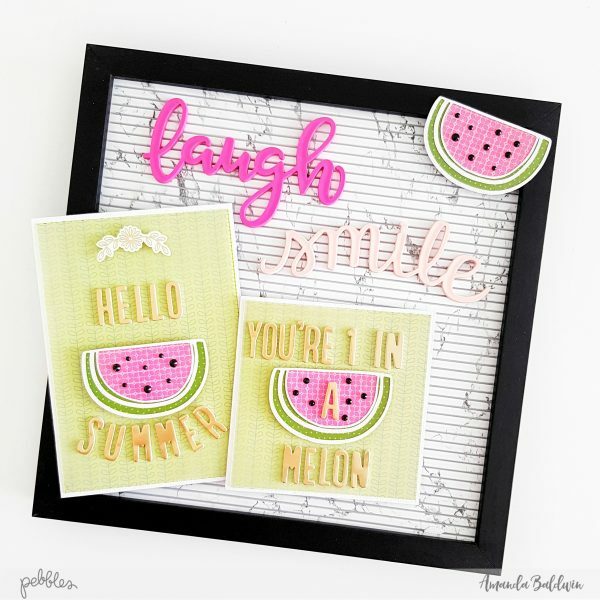 Using the same card bases, and other fruit pattern papers from My Bright Life, I was able to create a series of fruity cards…..
Aren’t these berry cards the sweetest?! 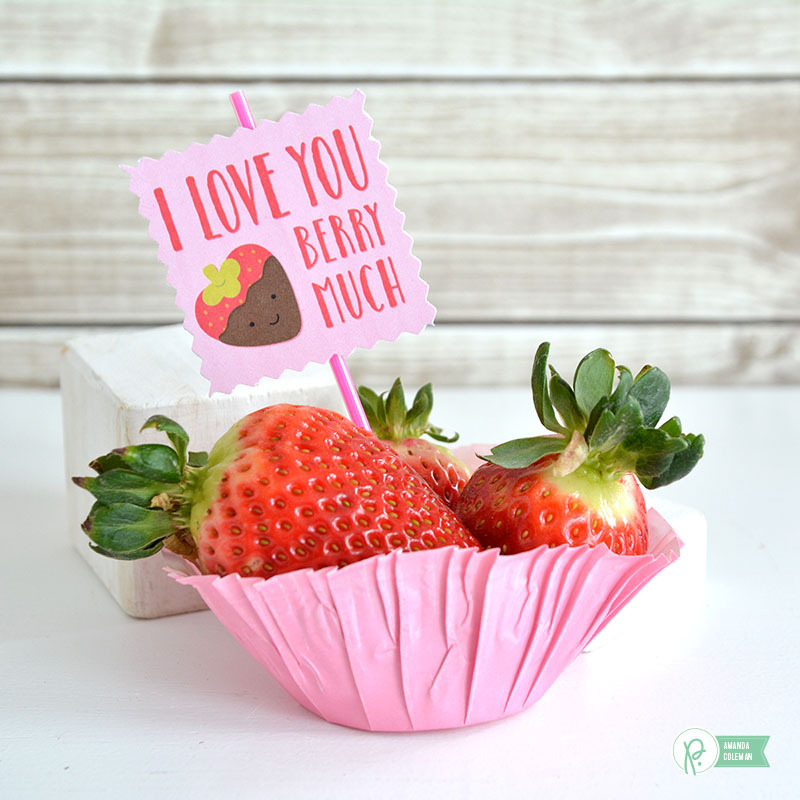 They feature pattern paper Strawberry Picnic, as well as the 6 x 6 Paper Pad, Ephemera & Puffy Stickers. Cute! 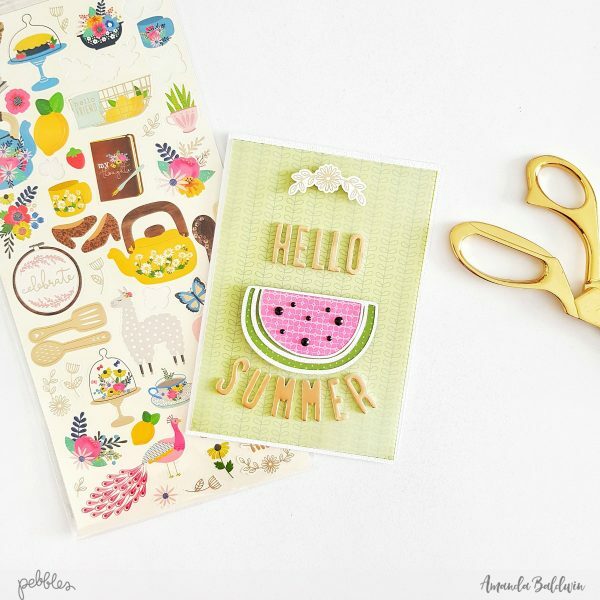 These lemon cards are full of sunshine and include pattern papers Fresh Picked and Lemons, as well as the 6 x 6 Paper Pad, and Ephemera. Adore! And last but by no means least, these pretty cherry cards are pink perfection! 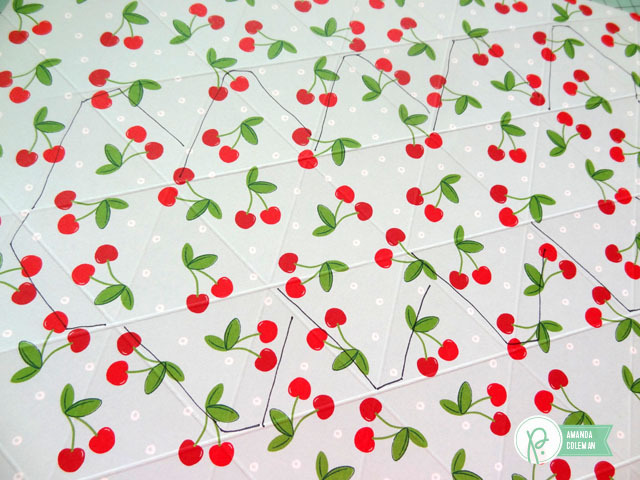 They include pattern papers Sweet Cherries and Little Thoughts, as well as the 6 x 6 Paper Pad, Ephemera, Puffy Stickers, Accent Stickers, and that fabulous Dimensional Sticker too! 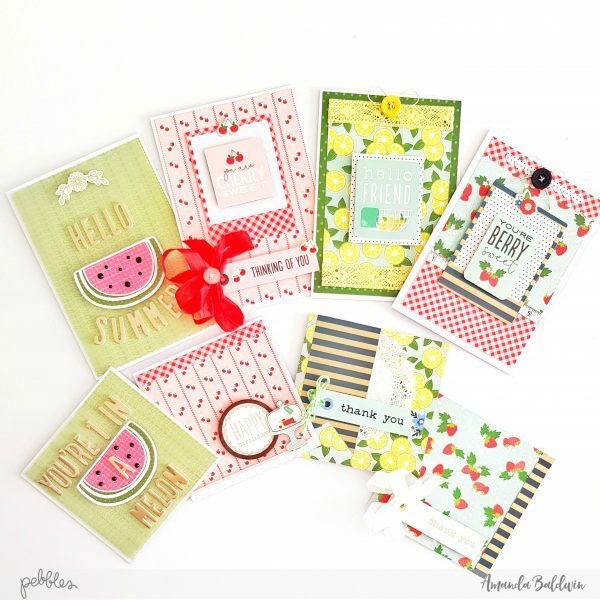 Deliciously sweet & fruity cards to share with family & friends! I hope I have inspired you to make some fruity-liscious cards! Hello everyone! Amanda here today. Valentine’s Day candy is the best. It is delicious to eat and fun to give. But there is something fun and novel about giving non-candy Valentine’s day treats as a gift or serving non-candy treats at a party. A healthy treat can really boost your energy when you are bogged down on sugary sweets. 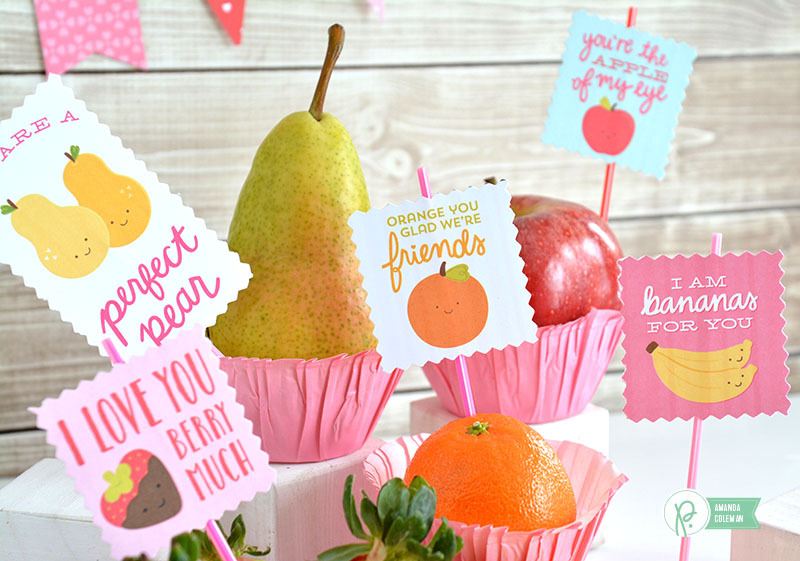 Pebbles Be Mine Collection fruity puns are perfect for dressing plain ol’ fruit and turning it into a party treat. 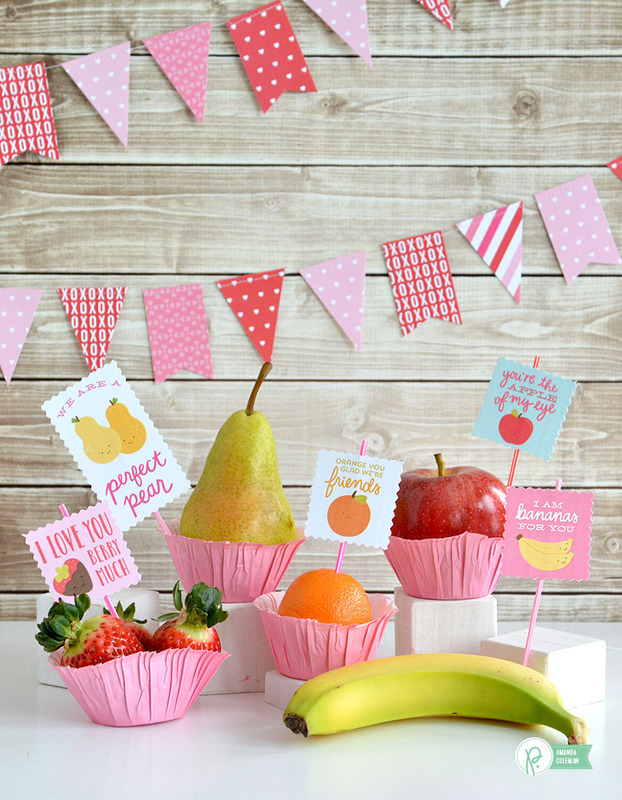 Room moms listen up–this is a super fun way to get kids to eat some healthy fruit in the middle of their sugar bombed classroom parties. My kids are already itching to eat this cute fruit. There are a variety of fruity puns for a variety of appetites. Not a room mom? These treats would be perfect for family members, friends, or even coworkers. 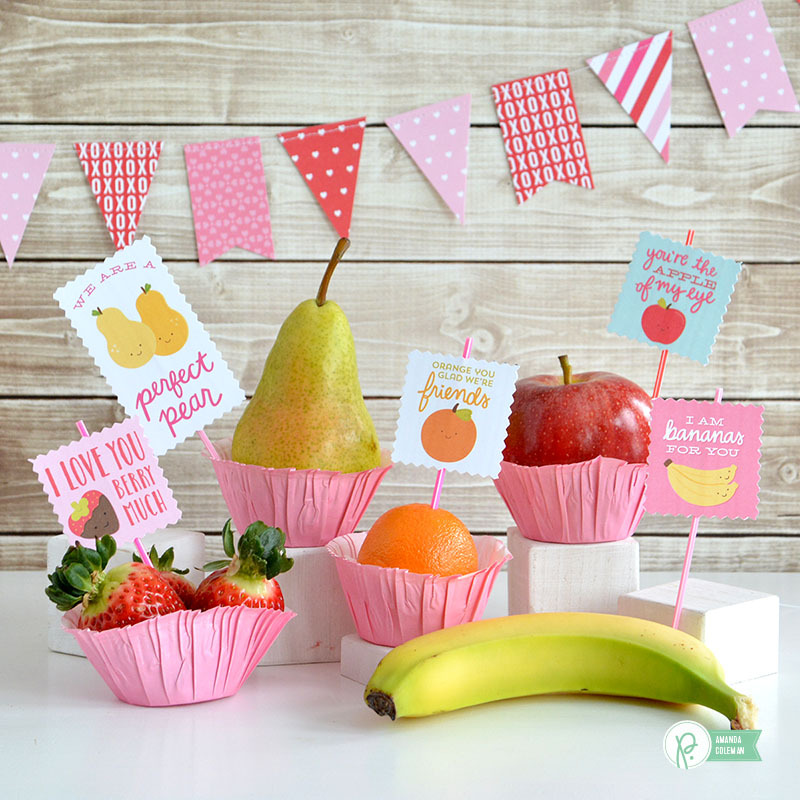 Place fruit in a treat cup or cupcake wrapper for easy serving. Insert the pick next to the fruit, or stick it right into the fruit so it stays put. These coffee stirrers are way cute, but a skewer or toothpick would work just as well. Step aside, paper trimmer. It’s time for the decorative shears to go to work. 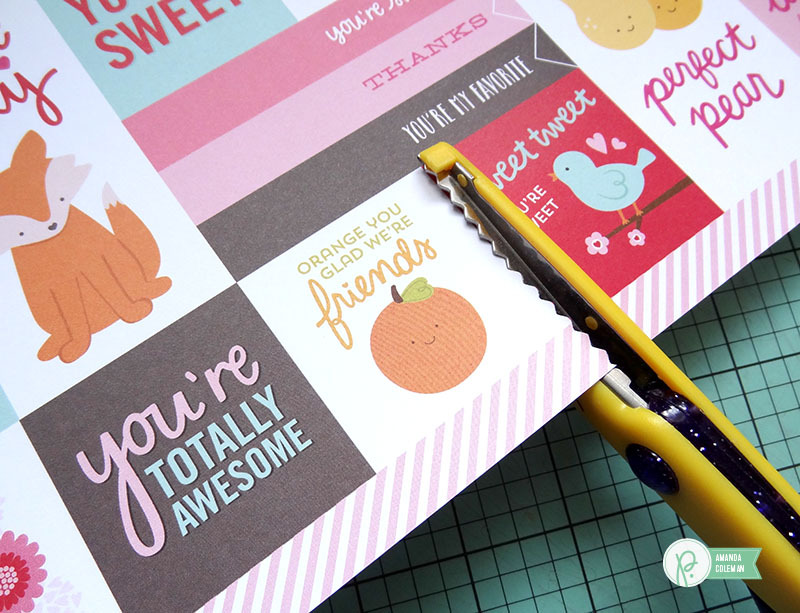 Using good ol’ pinking shears is an easy way to cut cards from a 12″ x 12″ piece of paper. Plus, you get a cool looking edge. Creating a decorative banner or garland is super easy with the WRMK banner punch board. 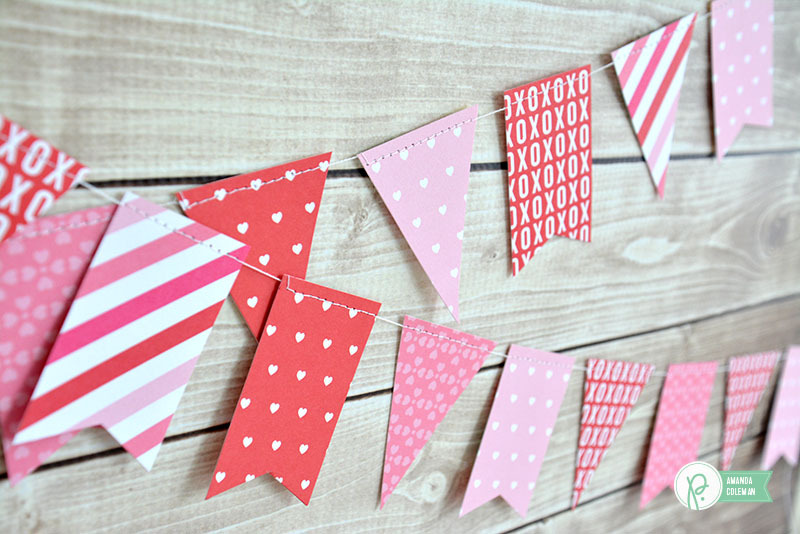 Use banners to spiff up your party space, or hang around the house just for fun. 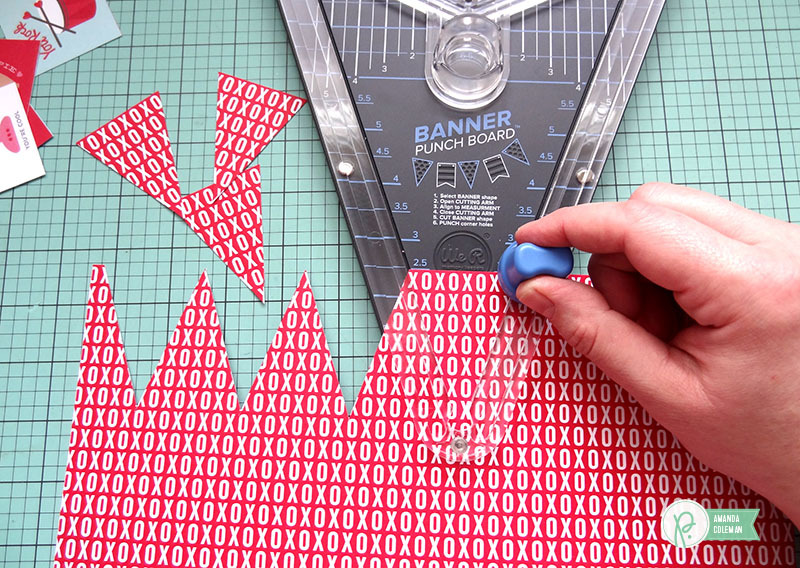 The guides on the Banner Punch Board make it super easy to cut out banners all the same size. Just run a sheet of paper through the punch board from one side to the other–no need to pre-cut individual rectangles. Hello Pebbles Fans! Amanda here today. Most of the time I don’t eat as much whole fruit as I should, but during the summer that all changes. There’s nothing quite as satisfying as diving face first into a slice of watermelon or stuffing my cheeks with fresh grapes. 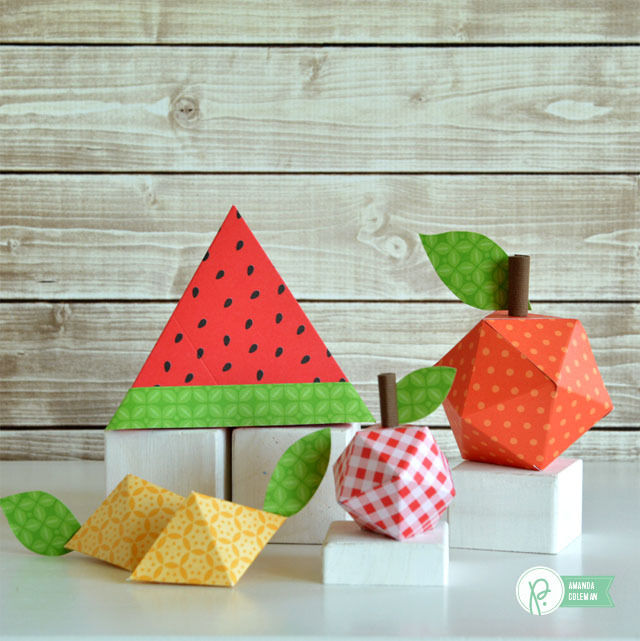 Inspired by Pebbles’ bright patterned papers, I set out to make some cute, geometric summer fruit to display all summer long. 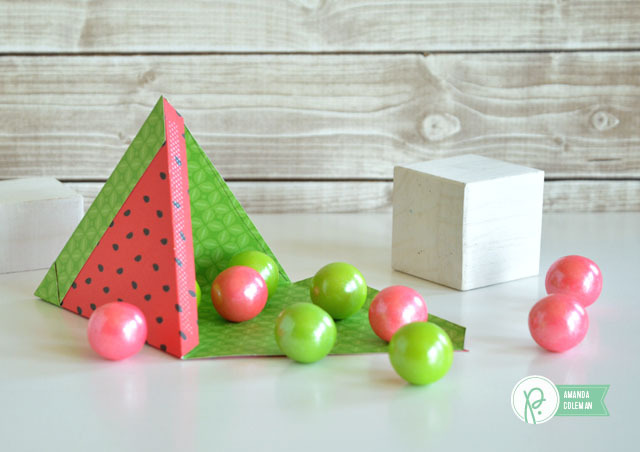 I couldn’t resist turning back to my favorite Pebbles watermelon paper. The only thing that makes me sad is that I can’t eat it. The shape of these fruits may cause you to think abstractly. I have never seen such an angular lemon, but it is charming. Each of these fruits is made with patterned paper from a different Pebbles collection. 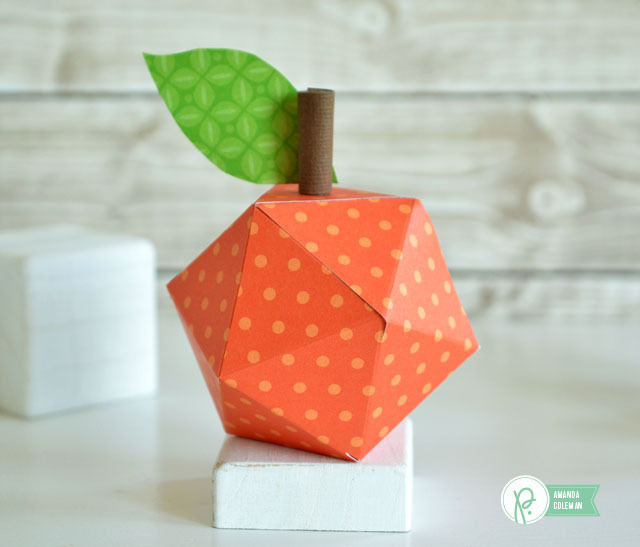 Add a rolled paper stem and a hand cut leaf to oranges, apples, or even little cherries. 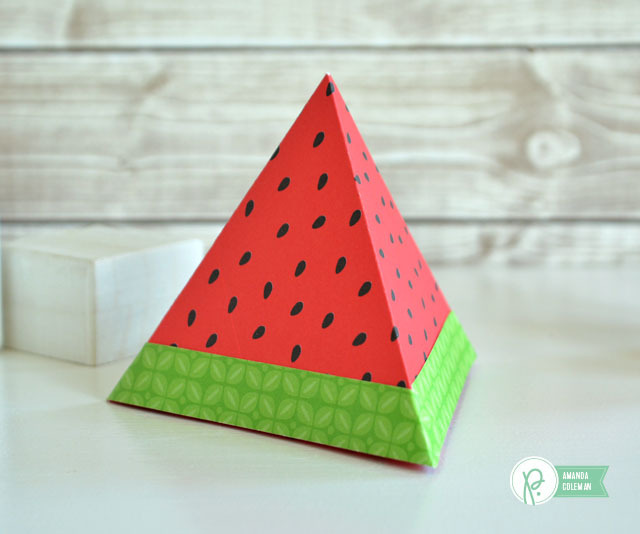 This watermelon box looks yummy enough to eat. Adhere a strip of green paper to the base of the box to create the rind. 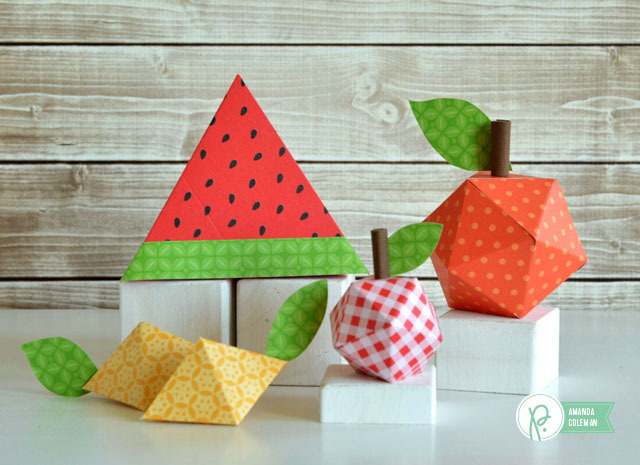 While these geometric fruit boxes would make lovely décor or a centerpiece, they can also be used as little treat boxes. Fill the boxes with yummy treats before you adhere the last opening. All of these boxes were made using a triangle score guide. 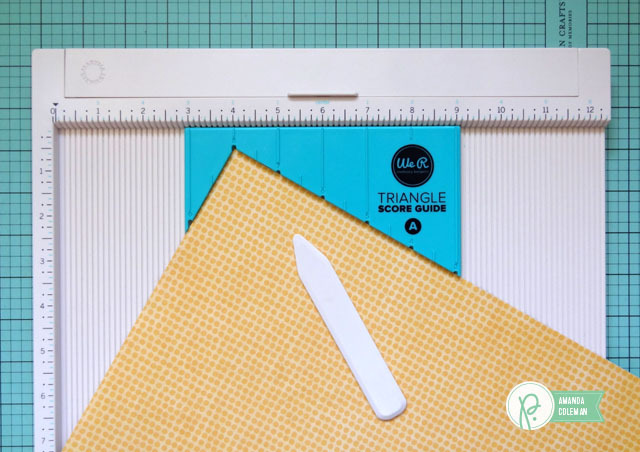 Simple insert the triangle score guide into any score board and you can score perfect triangles from which all of these different shaped boxes are created. After the triangle score lines are created, follow the instructions in the manual to cut out the shapes for each box. I quickly drew the cut lines on the inside of the paper I was using. 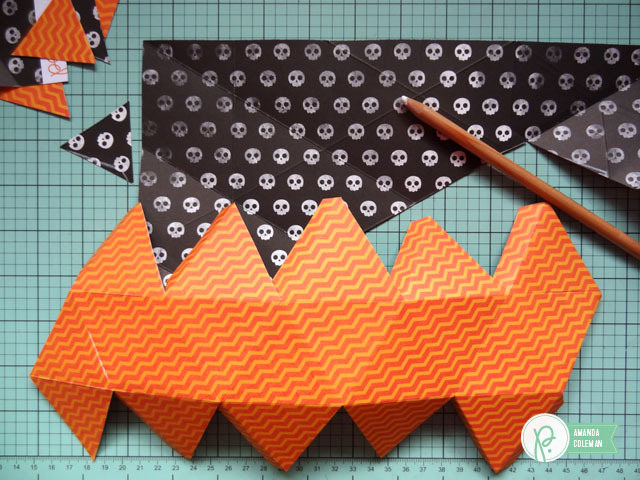 No need to draw pretty lines–you’ll make them nice and straight when you cut out your shape. Use a white pen or chalk pencil to trace the cut lines on a dark piece of paper.